Thanks for your help. It was fun, painless and reaped fantastic results. Pegine - AHHHHHHHMAZING! The role players were wonderful. Rita, it was better than I ever imagined! Tamera - You hit a home run with this job!! Everything is going great--one more session to go. Actors are enjoying it as well. Great job and much appreciated!!! The assembled talent fit the commercial better than we had hoped and I want to express my gratitude for all of your hard work and perseverance with our casting needs. Caleb, Erin and Allen fleshed out the writer’s vision (and more) and also had a lot of fun working together. You already know Caleb and his skill, but if you don’t know Erin you may want to note her as an actress with exceptional range as well as being very easy to work with. We have so many great takes from her that we will have a challenge in edit picking from all of our favorites for that one line! Allen was rock solid with his performance and well worth importing from LA. He had the looks, the swing, and the acting chops. The extras did well and really enjoyed all the time they got hitting balls on the PGA range. A great cast all around, thanks to you! Rita provides our skilled role players for our military and corporate situational training exercises. Her processes and procedures provide us with role players who have the expertise, security levels, and enthusiasm that we need for our work. Rita's commitment to our mission (producing extraordinary experiences worldwide inspiring billions to lead) is evident in how she works with my team, our clients, and those we train. She stays right along side me making sure that our role players are meeting our objectives. She coaches and consoles them so that they perform at their best. We consider her an integral part of our team. Joe Schreiber has endorsed your work as President at Martini Shot Casting Ltd. Co.. Details of the Recommendation: "We are all measured by how we react during the toughest of times. Rita Manyette passed her test with us with flying colors. First, she turned around a last minute request for casting of 16 actors for a television spot on a major network. Then on the eve of our shoot, Rita suffered a family tragedy, took care of her personal responsibilities and showed up an hour early for the shoot the next day. Rita's professionalism, affable personality and resourcefulness were integral to our success. We plan to have her travel for future business. Best of all, I've made a new friend." It was just splendid working with you today. You are sharp, fun, professional and have the perfect skill set for doing what you do. I am grateful and impressed. Rita is not only expert at her job (finding the perfect talent and giving many choices) but she is also very personable and very easy to work with. 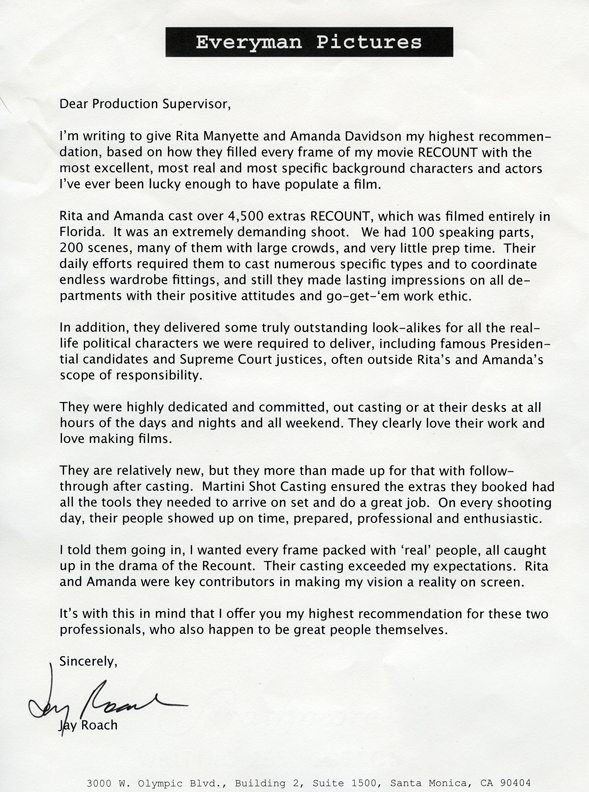 To all of our extras and look-a-likes for "Recount". This would not have been possible without you.